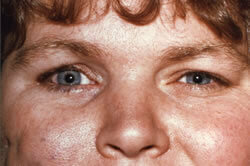 Entropion occurs when the lower eyelid margin and lashes turn or roll inward towards the eye. It causes irritation, tearing, and blurred vision. 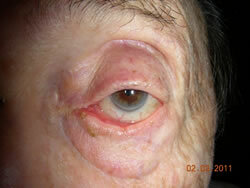 It can be caused by weakening of the eyelid muscles with age, inflammation, eye rubbing, injury, or tumor. 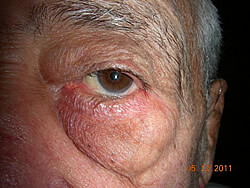 Other symptoms include chronic eye irritation and infection. Ectropion occurs when the eyelid margin turns outward.This is often due to weak eyelid muscles and the aging process, but may also result from prior injuries, eyelid surgery, or Bell’s palsy. Both entropion and ectropion can be corrected in our office surgical suite by tightening the eyelid muscles and the tendon attachments to restore proper function and to reposition the lid against the eye. Skin cancers are common tumors seen in all races and ethnic groups, especially in Caucasians. They are particularly evident in areas with warm sunny climates. 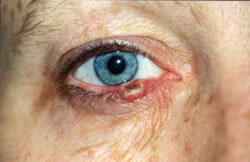 Eyelid skin cancers occur more frequently on the lower eyelid, but may occur anywhere on the eyelid or face. 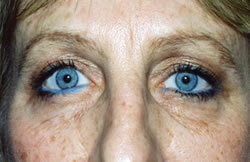 Usually, they are painless elevations or nodules of the eyelid margin, but they may be flat or cratered. Frequently, eyelashes are distorted or missing. 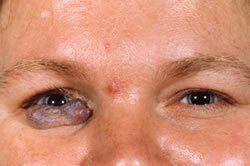 Other indications may be ulceration of the skin, bleeding, crusting, or distortion of the normal eyelid structure. A variety of treatment methods are available to assist with the management of these lesions with the goals being to completely remove the tumor and to preserve eyelid function. New techniques are available now to help insure a functional as well as a pleasing cosmetic result following tumor removal. Tearing is a frustrating problem for both patient and ophthalmologist. The most common cause of tearing is a dry eye. This does not seem right because it is hard to understand why the dry eye is always wet. The simple answer is that the chronic lack of sufficient tears in the dry eye causes the brain to tell the tear gland to pump out more tears. 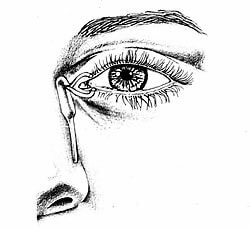 The gland responds but in a poorly controlled way, dumping tears into the eye, sometimes overwhelming the eye’s natural drainage system. When this happens, excess tears can well up in the eyes or stream down the cheeks. The other cause of tearing is a blocked tear drainage duct. Normally, tears drain into the nose and go down the throat. If the drainage system is blocked, the tears cannot exit the eye and again the tears stream down the cheeks. A thorough examination is required along with some special testing to determine the cause of tearing. Our office is equipped with the latest diagnostic equipment to help determine the cause of tearing. If tearing is bothering you, call today for an appointment.